After the current Nigerian president, Muhammadu Buhari was re-elected in February 2019, the country is facing internal political conflict. Since then, Buhari’s re-election sparked widespread protests and accusations of voting tampering from both political parties. Buhari belongs to the All Progressives Congress, or APC, a political party who dethroned the Peoples Democratic Party, or PDP, the former dominating political party in Nigeria in 2015, when he was first elected president. His rival, Atiku Abubakar (PDP), was previously the Vice President of Nigeria and was the closest competitor running against Buhari. Though Buhari has stood against political violence, his party is accused of rigging the election in his favor out of fear that Abubakar would defeat him. Sophomore Nmesomachukwu Ukachi Nwata believes the APC party is fearful of the PDP’s threat to their political control that they once took from PDP. BBC News reported that the opposing party called the election “unacceptable” and “incorrect”, accusing [APC] of scuttling the polls so Buhari will win. Abubakar refused to accept the election outcome stating that it was a “sham election” and would be taking legal action to challenge the results. Nwata believes the allegations surrounding the election considering Nigeria’s long history of political misconduct. The violence that followed after election day resulted in dozens of deaths, according to BBC News, including attacks from terrorist group Boko Haram. The violence carried on days after the election and has left a destructive tension between the two political parties and innocent civilians caught within the terror. 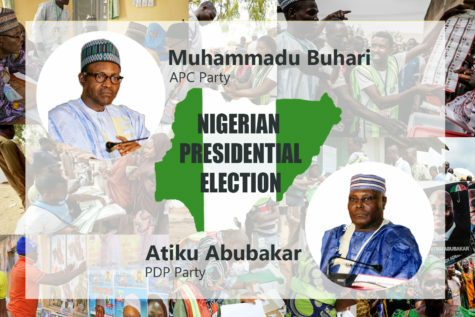 According to BBC, the election brought the lowest voter turnout in 20 years since Nigeria became a democracy come out and, Nigerians like Nwata and Uzoukwu are looking towards the future of democracy in the Nigerian government. Nwata, similarly, wants Nigeria to reach its potential in becoming a prosperous country that works in the benefit for its people. The Nigerian police have since released a statement that 128 people have been arrested with ties to tampering with votes such as snatching ballot boxes, trading votes, and impersonations and use of explosives.